All around the world, a large number of people die every year as a result of inhaling toxic gases encountered in their various fields of operations. These gases are found not only in industrial environments but also in nature: they are often odourless, colourless and cannot be detected by the human senses. What makes them all the more dangerous is that inhalation of these toxic gases often has the potential to cause lung and cardiac failure. The most common toxic gases found in the oil and gas industry are sulphur dioxide (SO2), hydrogen sulphide (H2S), carbon monoxide (CO), benzene (C6H6) and inert gases, such as nitrogen (N) and carbon dioxide (CO2). Toxic gases may be life threatening by nature at a low concentration, but others are poisonous. H2S, for example, which is widely found in the oil and gas industry is characterised with a pungent smell of rotten eggs. It is regarded a major hazard, as it counteracts oxygen and causes asphyxiation. These toxic gases can also be flammable, meaning that detection becomes very important to safeguard industrial assets. It’s often overlooked as a major hazard in most cases, but apart from inhalation effects, gases in the workplace also contribute to nearly all industrial fires and explosions. Most times people seem to forget that the atmosphere is what’s keeping us alive and if not sufficiently monitored can lead to catastrophic injuries, damaged assets, environmental pollution and fatalities. There have been abundant fatalities recorded from failures to detect gas and minimise its harmful effects. A typical incident occurred in 2010, where two contractor welders had unauthorised entry into a confined space and were inadvertently overcome by low oxygen, as a result of an argon rich atmosphere that was not initially detected. 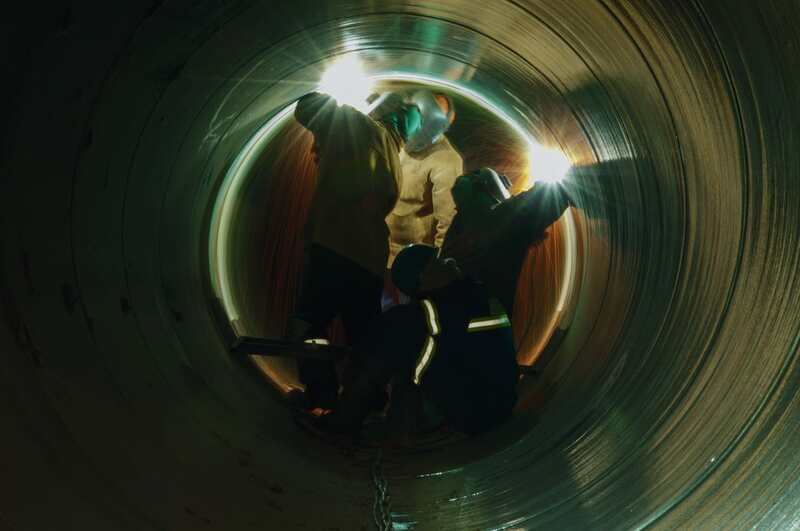 The welders completed a hot pass weld to connect a pipe of 36 inch to a nozzle on a heat exchanger vessel. After completing the task, the pipefitters were asked to shut in the argon source that supplies the weld purge, but due to the complex nature of the bottle set up, one of them was unintentionally left open. One of the welders entered the vessel head to inspect the inside of the weld and decided to pull purge dams using an external lanyard. As the dams were pulled the argon hose was still flowing and was drawn into the vessel head, increasing the atmospheric argon concentration. When the second welder noticed the first was in physical distress, he entered to initiate a rescue and was also overcome by the hazardous gas. Consequently, two fatalities were recorded when both welders were pronounced dead at the hospital. The cause of the incident was improper configuration of the argon cylinders: one cylinder was left on and confined space entry procedure was not followed to conduct gas testing prior to commencement of the task. Also, the Piper Alpha Disaster that claimed the lives of 127 people when a leak of natural gas ignited was another catastrophic event that caused damage to fire protection systems and gave rise to fires on an offshore platform. This incident remains the worst offshore and gas incident in history. What makes this event more tragic is the fact that each was preventable, the major hazards that could result from the gases released were well known, but protocol was not followed. Organisations would need to apply learned lessons to prevent gas releases by putting in place the right measures to detect gases and control them if a leak occurs to avoid any catastrophic event. Companies operating in high risk industries must undertake a structured review of any risks to plant, people, process and environment, and provide appropriate gas detection principles to alleviate the risk of explosions. The key is to ensure that elements of protection are appropriate to the level of risks involved at all times. Mostly, the gas detection systems are important and can be broken down into two categories: fixed and portable. These are permanently fixed installed gas monitoring systems that are tied to facility alarm systems, while portable gas detectors are used to evaluate specific work site conditions and detect any trapped gas. Fixed type gas detectors may be used for detection of one or more gas types. They are generally mounted near the process area of a plant or control room, or an area to be protected. In the industry, sensors are installed on fixed type mild steel structures with a cable to connect the detectors to on the ground SCADA system for continuous monitoring. A tripping interlock can be activated for an emergency situation. This gas detector is a device that helps to detect the presence of gases in a particular area as part of a safety system. This type of equipment is usually used to detect gas leaks and also has an interface with a control system so that a process can be spontaneously shut down when any gas is detected. The mechanism sounds an alarm to operators and gives the opportunity to escape. It is important to make use of this type of device as there are many gases that could be harmful to humans. Gas detectors, comprised of sensors to identify hazardous gas leaks, are used widely in the oil and gas industry to detect combustible, flammable and toxic gases, as well as oxygen depletion. These sensors are usually linked to audible alarms, creating alerts when dangerous gases have been detected. All of these sensors are used widely and can be found in, for example, industrial plant and refineries to help detect gases. The Catalytic bead type involves the use of combustible gas that is being operated by a catalytic bead to oxidise the combustible gas; typically the wheatstone bridge helps conversion, resulting in changing resistance to an equivalent sensor signal. A wire coil is coated with a catalyst coated ceramic that is being electrically heated to a temperature, allowing it to burn the gas that is monitored. However, as there is an increase in the temperature of the wire, the electrical resistance also increases. This resistance is measured by a Wheatstone bridge circuit and the result is converted to an electrical signal that can be used by gas detectors. It has long life, high accuracy, fast response and monitors a wide range of combustible gases and vapours in air. Similarly, Electrochemical Toxic Gases is used to detect toxic gases and uses an electrochemical reaction that generates a current that is directly proportional to gas concentration. The sensor contains a gel or electrolyte and two active electrodes. The sensing/working electrode (anode) and the counter electrode (cathode). The third electrode is used to build up a constant voltage between the anode and the cathode. The gas sample enters field the casing through a membrane and oxidation occurs at the anode, while reduction takes place at the cathode. When the cathode receive a positive ions and the anode negative ions, a current proportional to the gas concentration is generated. The component has high sensitivity, linear output and easy to handle. Also, electrochemical oxygen is used to discover oxygen deficiencies/enrichment using an electrochemical reaction to generate current proportional to the gas concentration. The sensor is a chamber containing a gel or electrolyte and two electrolyte and two electrodes; the sensing/working electrode and (usually lead) counter/reference electrode. The gas sample however enters the case through a membrane with oxidation reaction occurring at the anode and reduction reaction taking place at the cathode. When the positive ions flow to the anode, a current proportional to the gas concentration is generated. Portable detectors are commonly used to monitor the atmosphere around personnel and are worn on clothing or on a belt/harness etc. These gas detectors are usually battery operated to ensure functionality at all times. They transmit warnings with series of audible signals such as alarms and flash lights, whenever dangerous levels of gas vapors are detected. As detectors measures gas concentrations, the sensor responds to the calibration gas, which serves as the reference point or scale. As the sensor’s detection exceeds a preset alarm level, the alarm or signal will be activated. As units, gas detectors are commonly produced as portable or stationary devices. Originally, detectors were produced to detect a single gas, but now there are modern units that could several toxic or combustible gases, or even a combination of both types. The safe working levels that workers can be subject to, may vary among countries – so it is important to be familiar with legislation and requirements applicable in the country. The portable detection systems is used to protect workers undertaking routine tasks like maintenance, where employees might release gas that should not be freely present in work environment. Portable devices could also be used for sampling gases, when workers want to measure the quality of the atmosphere where proposed to work. These systems are mainly used to ensure protection of the worker, however, fixed systems could be used to protect many employees at a time. They detect weak points in plants where gas could escape, or detect leaks that could poise harm to people, local community, and the environment. There is gas detection equipment available for protection of human and facilities. They could be Single and multigas portable gas detectors for detection of flammable and toxic gases, including oxygen, hydrogen sulphide, carbon monoxide, CO2, etc. Below are some examples of available equipment for reference. These are single and multigas portable gas detectors for detecting flammable and toxic gases, including oxygen, carbon monoxide, hydrogen sulphide, SO2, CO2, HCL, VOCs, and flammable gases such as - methane, butane, pentane and others. This is a multi-function portable gas leak detector for the detection of flammable gases, hydrogen sulphide gases, carbon monoxide, and oxygen in industrial applications. These are fixed gas sensors for detecting a wide range of toxic and flammable gases such as CO, H2S, O2, SO2, CO2, HCL, flammable gases - methane, pentane, butane, and many others. This is available with intrinsic safety and flameproof designs. These are gas detection panels with displays and alarm outputs, and involve wall mounted and rack mounted gas sampling systems. These are flame detectors, approved for classified areas, UV - UV/IR - IR3 technology, it is false alarm protected, has a 90 degree cone of vision, and flame proof type “d”. There could be various health effects when these gases were inhaled beyond regulated limits. Human effects of various concentrations of gases (in atmosphere) could be catastrophic. Gas testing must be performed to confirm a safe working environment by recognising and eliminating flammable or toxic gas hazards before work commences, monitoring and maintaining these conditions throughout the activity or terminating the activity if adverse conditions develop. Gas testing requirements are recorded as a control measure on a work permit. 1. Initial gas test for combustible or toxic gases must be performed before certain work can commence, such as hot work. 2. Initial oxygen check must be performed before certain work can commence, such as confined space entry. 3. Repeat gas tests should always be carried out at specified intervals, typically after meal breaks or other substantial absences from work site. 4. Continuous gas monitoring – the work site must be monitored continuously using a portable or personal gas detector positioned adjacent to the job, which may be in addition to the requirements for initial or repeat gas tests by an authorised tester. Continuous gas monitoring is used primarily for jobs such as: confined space entry, hot work; spark potential such as opening electrical junction boxes; and breaking containment. The results of all gas or oxygen testing should be recorded on a work permit. Authorised Gas Testers (AGT) must perform all other types of testing with the exception of daily continuous gas monitoring. The following should be considered when performing gas tests: correct detector and scale for the purpose, wind strength and direction, ambient temperature, equipment or building configuration, location of engine exhausts or other potential contaminants, potential soil contamination, natural or forced ventilation, low points, drains or culverts, density of the gases to be tested (heavier or lighter than air), and the types of gases that may be present. The potential for ‘cross-contamination’ should be strictly evaluated at the minimum. The British standard BS EN 600079-29-3:2014 (IEC 600079-29-3:2014) International Electrotecnhical Commission (IEC) specifies the requirements for explosive atmospheres, the part 29-3 provided guidelines on gas detectors - guidance on functional safety of fixed gas detection systems. The IEC is a worldwide organisation for standardisation and identifies reference standards for use. It documents the requirements for performance of equipment for detection of flammable gas or vapour in explosive atmospheres. This standard complements the general requirements of IEC 60079-0. Where a requirement of this standard conflicts with the existing requirement of IEC 60079-0, the requirement of this standard takes precedence. It also contains some other important references to “IEC 60079-29-1, the performance requirements of detectors for flammable gases”, “IEC 60079-29-2, and “IEC 60079-29-4, the performance requirements for open path detectors for flammable gases”. Similarly, AS/NZS. 60079.29.4:2011, specifies the performance requirements of open path detectors for flammable gases. The objective of this standard is to establish the specific requirements for design, construction and testing of electrical equipment for flammable gases and vapours. However, in a typical offshore environment, the ISA standard is commonly the defacto global standard. Standards like EN 50402, EN 45544, and EN 50104 are used in Europe and others areas. Gas detectors are a critical part of the overall safety system. All gas detectors must be calibrated on a schedule for active use all the time. Among the two types of gas detectors, portables gas detectors must be more frequently calibrated due to the regular changes in the work environment. However, a typical calibration schedule for a fixed system could be quarterly, bi-annual or annual depending on the best practices available at the location. A typical calibration schedule for a portable gas detector is a daily bump test accompanied by a monthly calibration. All portable gas detectors have a specific calibration requirement which is available from the manufacturer and should be strictly adhered to. The dangers posed by toxic gases are very significant hence the need for detecting gas so that people do not get hurt and return home safely at the end of each working day. The detection is aided by functional instruments to guarantee safety. These instruments represent sophisticated hand-held technology that at certain times may well be the only thing that stands between you and sudden death. Remember that you are accountable for your safety and that of others. Take action now to protect you tomorrow and today.